Karl “Quax” Schnörrer was born on 3 March 1919 at Nürnberg. Schnörrer joined I./JG 54, based on the Eastern front, in December 1941 after completing his operational training with Ergänzungsgruppe/JG 54. Unteroffizier Schnörrer was assigned to 1./JG 54. He recorded his first victory on 13 December. Schnörrer earned the nicknamed "Quax" because he crashed three Bf 109 fighters on landing. Quax was an accident-prone cartoon character popular at that time. 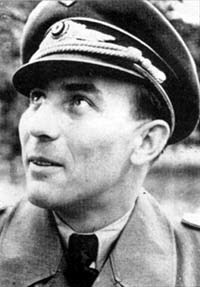 In late 1942, Walter Nowotny (258 victories, RK-Br, killed in action 8 November 1944) chose Schnörrer to be his Kaczmarek. Nowotny and Schnörrer were close friends and referred to each other by their nicknames - Nowi and Quax. Schnörrer had three victories to his credit at this time. By March 1943, Anton “Toni” Döbele (94 victories, RK, killed in action 11 November 1943) and Rudolf Rademacher (97 victories, RK) had joined with Nowotny and Schnörrer to form one of the most feared formations in the Luftwaffe - the Nowotny Schwarm. These four men combined to score over 500 victories! Nowotny led the scoring by shooting down over 140 aircraft while flying with these men. Schnörrer, by comparison, had, by 20 March, flown 146 combat missions and recorded just four victories, the epitome of a conscientious Kaczmarek. He recorded his 20th victory on 18 August. Eventually fate caught up with the Nowotny Schwarm. On 11 November 1943, Anton Döbele was killed after colliding with another German fighter over the airfield near Smolensk. Uffz. 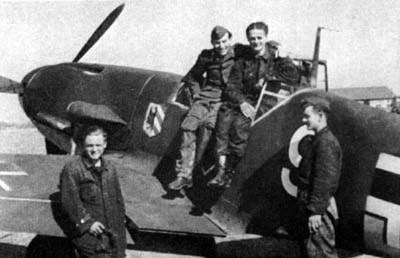 Karl Schnörrer (2nd from left) with his aircraft mechanics. The next day, Schnörrer would be seriously wounded. On 12 November 1943, Luftflotte 6 dispatched all available aircraft, a total of 215 sorties, despite the poor weather conditions, to the Nevel area. The Russians had broken through and were heavily supporting the advance with ground-attack aircraft. This was to be Walter Nowotny's last combat mission on the Eastern front, and Schnörrer flew as his wingman. Nowotny attacked a Russian Il-2 Sturmovik ground-attack aircraft and shot it down for his 255th victory. A second Il-2 attacked Nowotny’s Fw 190 but Schnörrer managed to bring down this Il-2 for his 35th, and last, victory with JG 54. Schnörrer’s Fw 190 A-5 (W.Nr. 410 021) then received hits from another Il-2. He baled out of his blazing Fw 190 at an altitude of no more than 50 to 70 meters. The parachute deployed only a few meters above the ground. German soldiers rescued the badly injured pilot, who had suffered broken legs and a skull fracture. The loss of “Toni” Döbele and the wounding of “Quax” Schnörrer was a severe blow to I./JG 54. Perhaps no one was more shaken than the young 23-year-old Schwarm leader Walter Nowotny. Shortly afterwards, Nowotny was withdrawn from front-line service and transferred to command Schulgeschwader 101 in France. Having recovered from his wounds, Leutnant Schnörrer was assigned to Erprobungskommando 262 in June 1944, flying the Me 262 jet fighter. Here he was reunited with Walter Nowotny. The unit was renamed Kommando Nowotny on 25 September 1944. Schnörrer personally witnessed the death of Nowotny on 8 November 1944. Kommando Nowotny was absorbed into JG 7 following Nowotny’s death. Schnörrer was assigned to 9./JG 7 and, on 19 March 1945, was appointed Staffelkapitän. While with this unit, Schnörrer achieved eleven victories, including nine four-engine bombers. He was awarded the Ritterkreuz on 22 March for 43 victories. On 30 March 1945, Schnörrer and Oberfähnrich Viktor Petermann (64 victories, RK) intercepted USAAF four-engine bombers over Hamburg. Schnörrer claimed two B-17s shot down, but his Me 262 was hit by crossfire from the bombers. He attempted to return to his base but was intercepted by USAAF P-51 fighters. Realising he could not outrun or out-fight them he baled out. Unfortunately, he struck the tailplane and, although in great pain, managed to open his parachute and land safely. He was to have one leg amputated, ending his combat career. Schnörrer died on 25 September 1979 at Nürnberg. “Quax” Schnörrer flew a total of 536 missions and recorded 46 victories. He claimed 35 victories over the Eastern front, including 10 Il-2 Sturmoviks. Of his 11 victories recorded over the Western front, all were made flying the Me-262 and included nine four-engine bombers.